All our self-catering static holiday homes near Perranporth, Newquay Cornwall, provide excellent value for money with something to suit all budgets and tastes. Situated between Newquay & Perranporth on the North Coast of Cornwall, Monkey Tree Holiday Park & Campsite benefit from having some of Cornwall’s finest surfing beaches just minutes away in Newquay. There are excellent access routes to the Holiday Park, just off the A30, making it a great base from which to explore Cornwall. We also have a specially modified Holiday Home with full disabled facilities and easy access, please call 01872 572032 for details. Unlike many Parks we do not charge for linen saving you up to £35 on your booking. In addition we do our utmost to reserve a specific home or set of homes for a group at no extra cost to you, saving upto an additional £32 per Holiday Home. Everything is included in the price of your stay, SAVING YOU UP TO £67! Our Porth range offers outstanding value for money for those looking for and inexpensive getaway. These comfortable homes are ideal for Families with 1 double, 1 twin and 1 crossover bunk bedroom. There is also a pullout bed in the living area providing accommodation for up to eight guests. These affordable holiday homes are spacious, bright and airy. 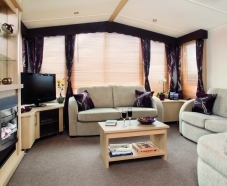 There is a roomy living area with gas fire, equipped with a 20” TV with freeview and DVD player. It has an ‘L’ shaped seating area with gas fire and open plan dining to comfortably seat six people. These are really spacious holiday homes accommodating up to eight guests in 1 double, 2 twins and a pullout sofa in the living area. All bedrooms are heated and this range boasts a separate shower room and wc. The spacious kitchen is equipped with a comprehensive range of units providing ample storage space. The Towan range offers more spacious accommodation for up to eight guests in 1 double, 2 twins and pullout sofa in the living area. All of the bedrooms offer ample storage and hanging space. There is also a wheelchair-friendly Towan holiday home available. These super homes provide luxurious and fantastic contemporary accommodation. Sleeping up to eight guests in 1 double, 2 twins and a pullout sofa bed, you’ll have all the latest innovations and central heating throughout. All of the bedrooms are tastefully decorated with good quality fabrics and furnishings. This fantastic top of the range of Holiday Homes are brand new to the Park for the 2017 Season. At 38 x 12ft these are some of the most spacious homes in our fleet boasting a modern and contemporary design and tasteful decor throughout. 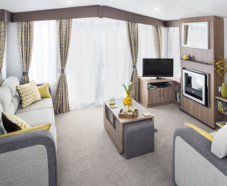 We are pleased to offer our modern and stylish Holywell range of holiday homes. Treat yourself to one of these gorgeous holiday homes at great value prices – the pictures speak for themselves!